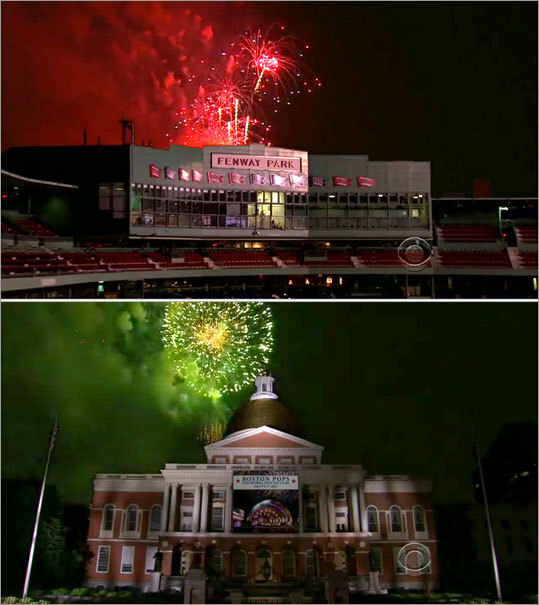 Those who watched Boston’s revered Fourth of July celebration Monday night on CBS were treated to spectacular views of fireworks exploding behind the State House, Quincy Market, and home plate at Fenway Park, among other places - great views, until you consider that they were physically impossible. As viewers began to point out yesterday, it would not have been geographically possible to see the fireworks above and behind the landmarks in question, since the display was launched from a barge in the Charles River and in directions away from those places. “According to CBS, you can see the fireworks from the right side of Quincy Market, even though Beacon Hill is in the way,’’ wrote “Kaz,’’ whose real name is Karl Clodfelter, a commenter on the Boston blog UniversalHub.com. “Also, they come up behind the State House when you’re standing across the road . . . which means the barge must have been parked on the Zakim this year,’’ wrote Clodfelter, a research scientist from Brighton. Mugar said the added images were above board because the show was entertainment and not news. He said it was no different than TV drama producer David E. Kelley using scenes from his native Boston in his show “Boston Legal’’ but shooting the bulk of each episode on a studio set in Hollywood. A CBS Television spokesman declined comment about whether the network was aware of, or approved of, the fireworks show being digitally altered. The footage of the landmarks was shot several weeks ago. According to Mugar, camera crews from Boston 4 Productions, the production wing of Boston 4 Celebrations Foundation, the fireworks show’s parent, crisscrossed Boston and Suffolk County shooting video of famous landmarks one evening in May. Entertainment or not, some viewers were not amused to learn that the footage was altered. T.J. Jeffers, decked out in a Celtics T-shirt and Red Sox cap, stood outside the JFK/UMass T stop yesterday and, with a toothy grin, declared his love for Boston and the Independence Day celebrations. At a Shaw’s grocery store in Dorchester, Penny Thompson, who described herself as “a lifer, born and raised in the Boston area,’’ expressed disappointment, but not over the quality of the fireworks display. Eric Deggans, a Florida-based media critic and regular panelist on CNN’s media critique show “Reliable Sources,’’ said the altered video presents a potential credibility problem for CBS. David A. Perry, a Massachusetts native who watches the televised fireworks each year from his home in Delaware, Ohio, and who first alerted the Globe to the altered video, had a similar, if more tempered, reaction. “I was already just dismayed with the coverage,’’ said Perry, a 45-year-old computer programmer who left New England five years ago to relocate to his new wife’s hometown. “They didn’t pan out enough to show what was probably a crowd of half a million. They made it seem like just 2,000 people were there. But then I started seeing some of the angles. And let me tell you, I’ve been to plenty of Sox games. So I knew the angles and the backgrounds weren’t right. James Burnett III can be reached at james.burnett@globe.com.